Three species of Chloroxybacteria (earlier 'prochlorophytes', Lewin 1977) have been described: Prochloron didemni (Lewin 1977), Prochlorothrix hollandica (Burger-Wiersma et al. 1989), and Prochlorococcus marinus (Chisholm et al. 1989, 1992). All contain both chlorophyll a and b, but are morphologically diverse. There is no evidence that they are monophyletic. 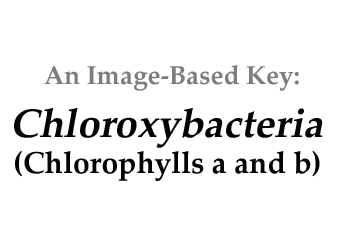 Margulis and Schwartz (1988) recognized the unique status of this group as well as its bacterial nature by the phylum name, Chloroxybacteria. The presence of chlorophyll b in a procaryote ancestral to the eucaryotic green algae (Chlorophyceae) and terrestrial plants is evidence that the pigment did not arise more than once, certainly not in the 'higher plants'. What is yet unknown is the origin of chlorophyll c in the eucaryotic ochrophytes, non-ancestors of higher plants. However a chlorophyll c-like photoactive pigment, that may be chlorophyll c itself, has been isolated from Prochloron (Larkum et al. 1994). The cryptomonads, based on recent molecular analysis, appear to be ancestral in containing this pigment, and genetic similarity suggests acquisition from the rhodophyceae (Bachvaroff et al. 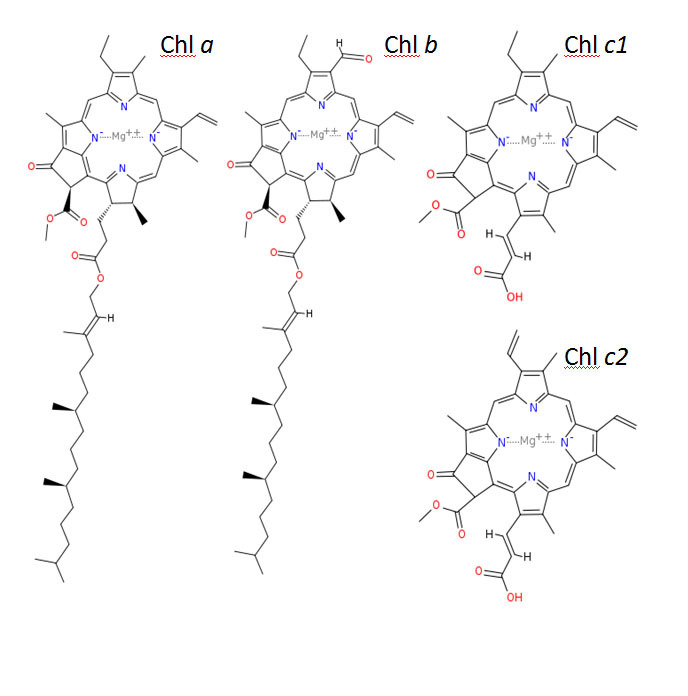 2005) although the origin of the pigment istelf is still obscure because there are no known rhodophyceae that contain chlorophyll c.
Chlorophylls a,b,d, and f are similar tetrapyrole rings with a phytol tail. Chlorophylls c1 and c2 lack the phytol tail. Bachvaroff, T.R., P.M.V. and C.F. Delwsiche 2005. Chlorophyll c-containing plastid relationships based on analyses of a multigene data set with all four chromalveolate lineages. Mol. Biol. Evol. 22(9):1772-1782. Hoffmann, L., and W. Greuter 1993. Validation of Prochloron didemni (Cyanophyta) and Nomenclatural Discussion of Correlated Names at the Higher Ranks. 1993. Taxon 42(3):641-645. Larkum, A.W.D, C. Scaramuzzi, G.C. Cox, R.G. Hiller, and A.G. Turner 1994. Light-harvesting chlorophyll c-like pigment in Prochlorn. Proc. Natl. Acad. Sci. Usa 91:679-683. Lewin, R.A. 1977. Prochloron, type genus of the Prochlorophyta. Phycologia 16:120.